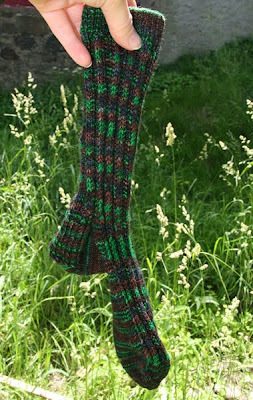 I can’t believe it took me three months to knit one simple sock. Recently my displaced knitting group finally settled on a new location, so at the first meeting I attended after our hiatus I spent a good solid hour and a half working on this sock, which was just the push I needed to get me going again and I finished just a couple of days later. I was so bolstered by my success that I immediately cast on for the second one. Hopefully I am making the same size as the first one. Usually when I make something which will require a second (sock, mitten, sleeve) I make notes about the first one so I can replicate it. I am smart that way! For some reason I have no notes on this sock. It’s very simple, but I had hoped I made notes on the size, how many rounds I knit for the cuffs, etc. But I searched all over for the scrap of paper with this important information and couldn’t find it. I’m trying to train myself to record this sort of information on my Ravelry project page, but apparently I haven’t succeeded yet.